Love to take your truck to its extreme? Or maybe you love the sound of an AGGRESSIVE and POWERFUL sound to your Ford F-150. Whether for performance or visuals (maybe both), Gibson's Extreme Dual Bolt-on Cat-back Exhaust is the PERFECT modification for your vehicle. 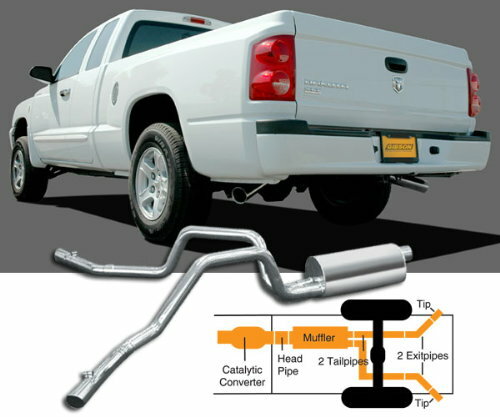 Not only does this exhaust give you the amazing sound, but it turns your car into a uniquely different look, making your truck one-of-a-kind! The pipes exits behind the rear tires at an angle. Dyno-tested to give you enhanced acceleration, maximum passing & towing, and INCREASED horsepower. **Note: Will not fit with a fifth wheel trailer hitch.